If you are looking for an alphanumeric controller plus joystick that provides big-time results, look no further than Sokkia’s SHC2500. The SHC2500 data collector incorporates the Windows CE.NET 5.0 operating system on a crisp, bright, color touch screen display that makes your field data come alive. The SHC2500 contains two removable Li-ion batteries that supply power for up to 40 hours. Manually selectable suspend mode or auto-suspend function conserve battery power while the instrument is not used. Batteries can be easily replaced on work site. CE.NET 5.0 Operating System Windows CE.NET operating system provides a modern operating environment and added expandability with other application software. The fast 624MHz processor leads in performance and reliability. Simple and familiar functionality leads to short learning curves. It also allows higher resolution images to be processed. The SHC2500 is loaded with all the memory you should need. Primary program RAM is 256MB. In addition, it includes 2GB Flash memory. Use the USB mini port as both Host and Client. This On-The-Go functionality allows for expanded memory and easy file transfer through USB drives or ActiveSync connection. Bluetooth and Wireless LAN come standard. No need for expensive upgrades or CF cards. Use your device in a typical Hotspot to surf the web, check weather, e-mail files back to the office, etc. 5 megapixel camera provides picture taking ability. The camera has an auto-focus function and 4 LED flash illuminators. Store photos in BMP or JPG format, and if you fill the memory, simply use a common USB flash drive to offload images. This highly advanced camera can be used to associate photos with stored points as Photo Notes. For every topo shot, as photo note can be stored. 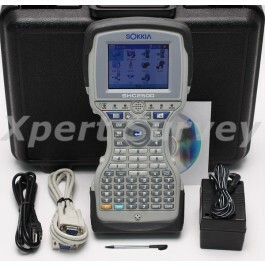 The SHC2500 also reads bar codes using this camera. The SHC2500 is rated at IP67, which means it can be temporarily submersed in water. The unit also has a 1.2m drop proof rating.